You ain’t seen nothing Yet…man! 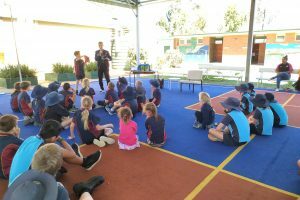 Last Thursday was Australian Reading Hour, an initiative to get everybody reading for an hour. In other words, it was a reminder to DEAR (Drop Everything And Read). There were plenty of celebrations and events across the country. Author pal Mick Elliott and I were headed to Yetman, 141 kms from Moree in Northern NSW. We were joined by Daily Telegraph’s Art editor and journo, Elizabeth Fortescue and cameraperson, Luke Cornish. After surveying the grey, dry lands on our flight to Moree, we drove for 90 minutes to Yetman Public School, and witnessed the impact of the drought up close. Mick and I were headed to Yetman to inspire kids to read. This is the MO for all authors who visit schools, we want kids to be excited to read (our books in particular haha). But our visit carried a significant weight, as we were waving the flag for ARH and being featured in the Daily Telegraph. So, no pressure haha. As soon as we stepped into the school grounds, we were greeted with the famous country school charm, home-made treats including the best sticky date cupcake I’ve ever had. Mick and I took turns with our presentations, underneath the cola outside. I first met Mick at a festival last year, and we’ve been friends since, so it was cool to team up with someone who has a knack with engaging kids like he’s a host for a children’s show. His experience working with children’s TV really does come in handy. There were also other kids from neighbouring schools (still an hour and half drive’s away from Yetman) and he roped them all in with his interactive discussions. So the audience was warmed up by the time I came on. I spoke about my love of books, particularly the classic Charlie and the Chocolate Factory before doing my usual spiel of playing with plushies and getting my Shrek toy to marry one of the girls there. Don’t make me go into details haha. We asked kids about what kind of books they loved, and most of the responses were funny stories, Dog Man, The Bad Guys and Captain Underpants. After the presentations, we were mobbed by kids and this is where we really get to engage with them on a more personal level. Every bookmark I signed came with a few questions and hearty conversations. I met someone who was Australian Filipino and spoke in a broad Aussie accent about working on a farm. There were easily excited kids who wanted to play with my plush toys and create their own stories. A few wanted me to play handball. Then we went into their classrooms, where Mick and I got to a few writing exercises to finish up the day. While the kids and teachers got something out of our visit, the inspiration was a two way street. In my previous blog, I spoke fondly of visiting country towns. 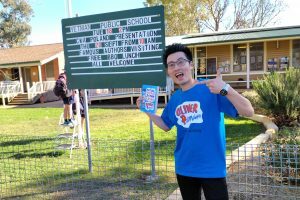 I soaked up a lot of things at Yetman for my upcoming story about an Asian kid living in a country town. What kept coming back to me as a theme was the drought. The free BBQ was also a fundraiser for the drought appeal too. You hear about the drought from the confides of the city, but it’s until you see it for yourself does it really hit you. The kids were so resilient talking about how the drought has affected their everyday lives. Yetman got a small sprinkle of showers two weeks ago, so their lawns were green. But as one of the school leaders pointed out, it will soon disappear and become dry again. She said, one day the drought will break…hopefully. Our books were supposed to arrive before our visit, but the courier only comes once every 2 weeks, so I think they should be getting them this week. I know these books will be cherished because they have heard our voice, our passion behind writing our books, as well as how reading has shaped our own lives. That impact will be felt for months to come. 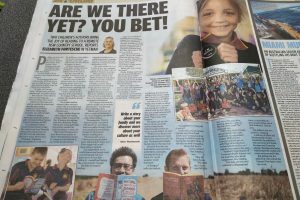 I mentioned in my interview that books are an escape to a new world, and I can’t help but wonder how much more important that is for kids out there in the bush. Chalk this up as another memorable moment in my cHEwY journey.